Ellipticals are a go-to piece of cardiovascular exercise equipment for people with lower body injuries who still want to burn a significant amount of calories. That's not to say that ellipticals are perfect; as with any repetitive motion, ellipticals have common overuse injuries. The strain or putting your body into a fixed position with constant motion over an extended period of time can put strain on joints and muscles. The best option when doing cardiovascular exercise is to switch modes and keep your body from falling into a routine. An elliptical is a low-impact, total-body piece of cardiovascular equipment. It simulates running, but without the impact of your feet on the ground because your feet are in constant contact with the foot pads. On many machines, your arms hold onto handlebars that pump in rhythm with your legs, so it works both the muscles of the upper and lower body. The elliptical is usually a good option for people who are newer to exercise and need to increase strength and stamina. Overuse injuries occur when the body has repeated, consistent stress placed on it without decent rest and recovery periods. They can involve the shortening of certain muscles and the elongation of others, causing imbalances that further increase injury. Overuse injuries also occur when joints are placed out of natural alignment, causing wear and tear that can weaken joints and lead to injury and arthritis. The most common overuse injury on the elliptical involves the knee. Rick Kaselj, a kinesiologist and rehabilitation expert, says the elliptical forces your body to be in a fixed position that may not naturally be in your proper alignment. If your hips are wider than the foot pedals, then your knees may bow inward, putting stress on the medial area of the joint. The elliptical forces you to exercise on the balls of your feet, which engages the quadriceps muscles. This can pull on the patella, or kneecap, and can cause sharp pains on the top of the knee, also called patellar femoral syndrome. 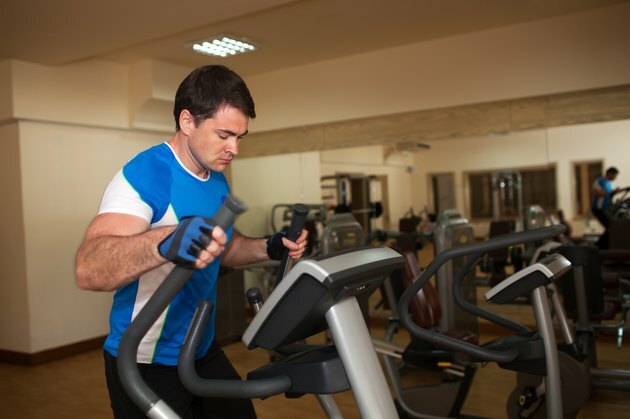 Exercising on the elliptical may exacerbate certain conditions and cause further harm. Whether the elliptical solely responsible for these injuries or they are only aggravated by it, it's best to avoid the elliptical if you have them. According to Damien Howell Physical Therapy, these include any type of foot injury with pain on the ball of the foot such as collapsed arches, Morton's neuroma, bunion or arthritis, because most elliptical work requires being on your toes. Avoid the elliptical if you have pain in the hips or bottom, also called piriformis syndrome, because the elliptical can further tighten the piriformis and worsen the condition. The best way to prevent overuse injuries is the change your mode of exercise. The American Council on Exercise recommends 30 minutes of cardiovascular exercise on most days of the week. Change it up to include swimming, treadmill or cycling. It will keep you from falling into a rut and elicit better health benefits than just using one mode. Stretch after every workout to prevent muscle imbalances. After using the elliptical, stretch your quadriceps, calves, hamstrings and back to prevent excessive tightening.